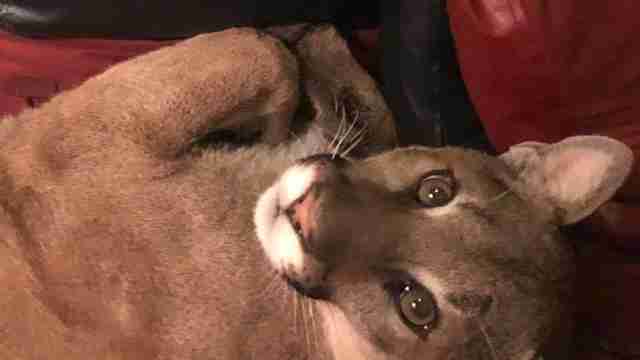 Last Sunday night, Oregon resident Lauren Taylor entered her living room — and was met with quite the unusual surprise. 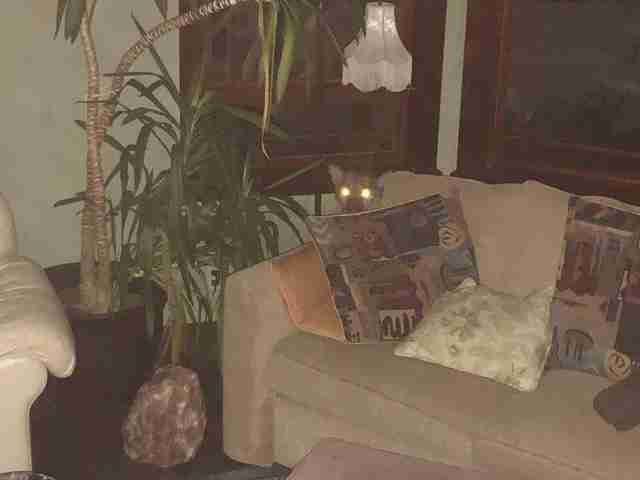 A pair of yellow-brown eyes were staring up at her from behind the couch. Apparently, someone had left the back door open, and the curious cat had wandered right in after drinking from a fountain in the yard. Taylor’s housemate noticed the animal first and shrieked, causing the lion to retreat behind the couch. Taylor, who has previously worked in wildlife rescue and also practices energy healing, knew they’d have to give the cat a lot of space and remain calm to encourage her to leave safely. Taylor saw the lion lie down, so she quietly went outside to keep watch through the window. As the minutes passed on, and Taylor remained outside, the lion continued to sleep. Eventually she woke up and noticed the human staring in at her. Taylor began blinking slowly at her — which in feline body language signifies that you pose no threat. 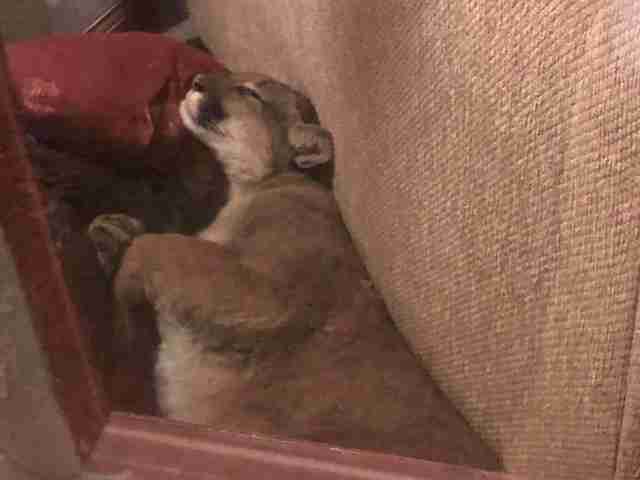 Taylor remained outside for nearly six more hours as the lion continued napping behind the couch. “It was just a couple hours to dawn and we needed to prompt her to leave without alarming her so much that she panicked,” Taylor said. She and her housemates slowly opened a few more doors and started lightly tapping a drum from a safe vantage point at the top of the stairs. As quick as the lion came, she left. 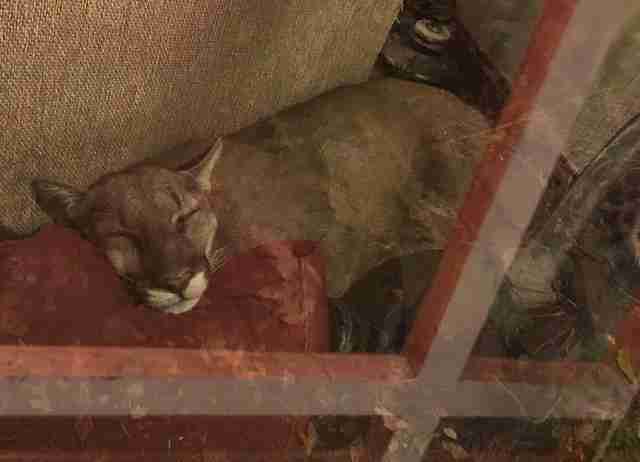 Despite the lion’s clear signs of being comfortable in Taylor’s home, she’s certain that the animal was just passing through. There have been wildfires in the area recently, and it’s likely that’s what pushed her to wander into the neighborhood. The humbling experience, though, is one that Taylor won’t soon forget.